Prior to my becoming Co-Director of the Center for Advanced Medical Simulation in 2008, I practiced General and Vascular Surgery with Memphis Surgery Associates and was a Clinical Instructor in surgery at the University of Tennessee Health Science Center in Memphis. For multiple reasons, it became progressively apparent that the educational paradigm was shifting to include simulation as a necessary component of the curriculum. As I contemplated my continuing role in healthcare, the evolving and potential role of simulation in educating our healthcare professional became more fascinating. It would certainly translate into a more competent healthcare team and improved quality and safety of care for our patients. 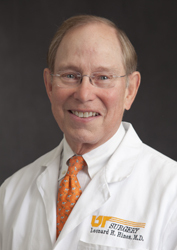 The reputation of the University of Tennessee Graduate School of Medicine, Knoxville, of being on the cutting edge of advancing educational techniques and the commitment to simulation were significant factors in the decision to shift my focus to this exciting approach to improving the quality of healthcare education and training. I believed that my previous experience as a practicing surgeon and clinical educator would provide a beneficial perspective and encouragement of colleagues to support the incorporation of simulation into the educational culture. Considering the already accepted benefits and the extent to which simulation is been embraced by those involved in education and training, our Center will evolve as a valuable asset to this medical community and the patients it serves.